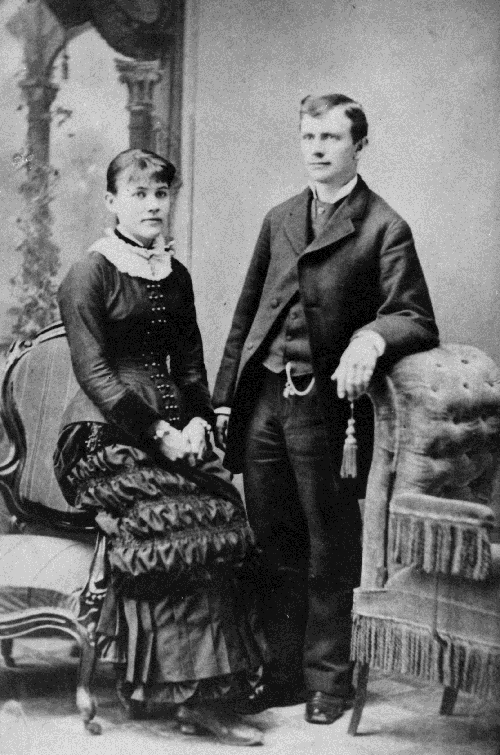 Studio portrait of James Sinclair and his wife Isabel Irving. James Sinclair was the first teacher in Maple Ridge. James Sinclair was born in Cowlitz, Washington, in July of 1858. His parents were William Sinclair and Jemina Kitson. James was the first school teacher in Maple Ridge in 1875, coming from Normal School in Victoria at the tender age of seventeen. His school was a one room building, heated in winter by a pot-belly stove and stood in a clearing overlooking the Fraser River, near the corner of 3rd Avenue (now Laity Street) and River Road. The only other buildings nearby were a church, a small store, and one or two settlers’ cabins. During that first school year there were only twenty families scattered throughout Maple Ridge. They were strung out for fifteen miles along the Fraser River, from Whonnock in the east to the Pitt River in the west. That morning in 1875 when the school first opened, James Sinclair faced sixteen eager pupils. Some of them were barefoot, and most of them had never been in school before. Their ages ranged from six to twenty-seven, making many of them older than James was. There were four Irvings, two Hendersons, three Dawsons, one Mayo, two Hinches, and four from William Edge. Despite bad roads, epidemics, and a small population, the enrolment grew rapidly. By 1878 James was teaching high school work, giving Maple Ridge the distinction of being the first school on the lower mainland of B.C. to offer high school subjects. When he learned that there were two families living across the Fraser River without access to an education, James bought a large rowboat for $25. Twice daily, for the next two years, he rowed across to the Langley side, carrying seven more children to and from his school. Three children were from the Muench family, and four from the Jenkins family. In 1882, after the new school was built, James resigned from his position as he was doing too much work and was feeling extremely overwhelmed. According to his memoirs, he had come down to a mere 125 pounds. Also in 1882, on September 10th, James was married to one of his students, Isabel Irving. Together they had eight children, starting in 1885; Gertrude Jessie, Maude Rhea, Laura Elizabeth, James Darrell, William Irving, Victor Gordon, Dorothy Darling and Agnes Isabel. After leaving the Maple Ridge School, James took over the school in Fort Langley and remained there for four years. At that time, he moved to Hammond where he had built a hotel during the boom days. He remained in Hammond for three years, and during this time, was elected as councillor for Hammond Ward and was also a school trustee. After these three years, James rented his hotel to Mr. T. Buck and said a fond farewell to Maple Ridge. James passed away on June 21st, 1941 and is buried in the Fraser Cemetery in New Westminster.